Pop goes the pink! A gorgeously chic gift for any occasion, this perky pink and orange bouquet is pure fun, especially when it''s hand-delivered in our fabulous fuchsia Cube! 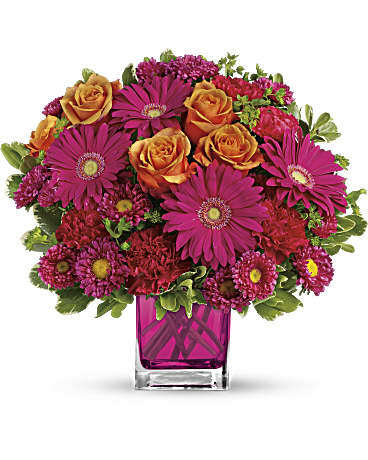 This brilliant bouquet of lush orange roses, hot pink gerberas, carnations and matsumoto asters are accented with bupleurum and variegated pittosporum. Delivered in a glass Cube. This item is hand-arranged and delivered by our florist. All prices in CAD Dollars.